Through humor and irony, Nina Komel examines the position of an artist and art in Bosnia and Herzegovina as an anomaly in a system that fragments the geopolitical, social, economical, and ethnic sphere. Komel uses assemblage strategies to play with colloquial language and bureaucracy, incorporating found objects as signifiers of shifting values and economies as a method to intertwine personal, micro, and macro politics. 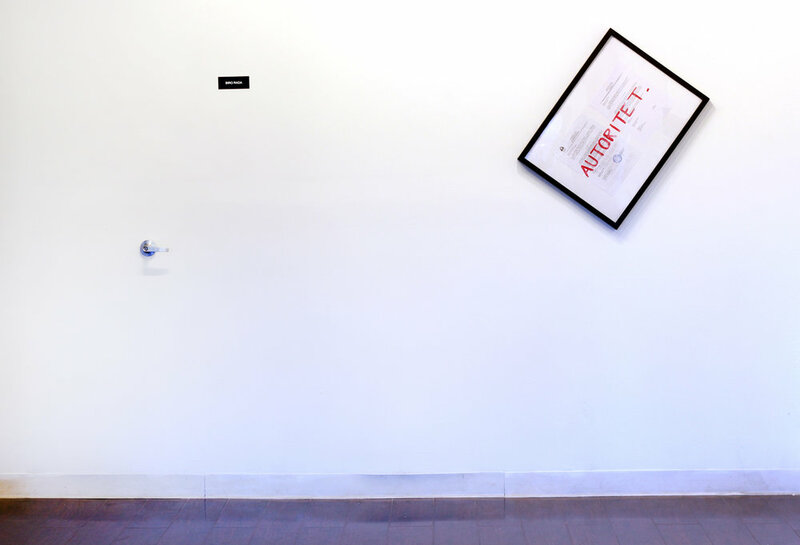 Charting Absurd is an interactive multimedia installation comprised of text, objects and sound that attempts to systematize absurdities into a cohesive whole. Komel amplifies clichés (Time is Money; Taste) that are being disproved by everyday reality where society and its participants live the failure of post-socialist and capitalist value systems. The most recent 2016 statistics show that unemployment rate in Bosnia and Herzegovina reached 42.6 percent. 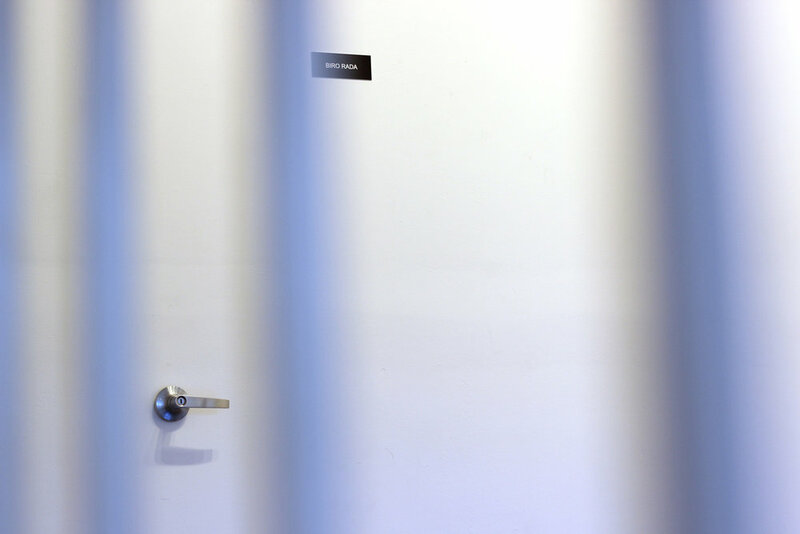 Citizens waiting for employment are enlisted at the BIRO RADA/ Employment Bureau which door represents only an initiation of hope and trust in dysfunctional institutions. She lets AUTORITET. hang off the wall carrying a personal document that testifies that an artist’s achievement is a burden to the society. That brings us to a conundrum that Mladen Stilinović (1947-2016) dealt with In Praise of Laziness (1993), stating that there cannot be art in the West due to an insignificant capitalist value systems that shape it as well as the artists into a product while the absence of these systems enables contemplation of laziness. Taking this perspective into consideration, Komel plays with her current position using the exhibition as a ritual of removal, presenting herself as an artist anomaly. She cast her own ear to emit the Bosnian national anthem Intermezzo symbolically representing a transitional state on the way to self-definition. The artist’s ear becomes a receiver and an emitter, an irrational testament to daily navigation of imposed cultural and societal mechanisms. Nina Komel is a conceptual artist whose work is based on documenting and emphasizing the absurd state of everyday interactions and value systems in Bosnia and Herzegovina that occupy both personal and public experience. Focusing on the state of isolation Komel works in a range of media, from text to immersive interactive installations using visual and non-visual language. Using transformation through irony she recognizes the accumulation of contradictions in a current state of the culture and the pressure it imposes on the artist and the citizen. She lives in Bosanski Brod, Bosnia and Herzegovina. Charting Absurd has been produced during her two-month residency at Residency Unlimited, Brooklyn that Komel received as the winner of the Zvono Award organized by Sarajevo Centre for Contemporary Art (SCCA), Residency Unlimited, New York, and support from The Trust for Mutual Understanding. Residency Unlimited is grateful to partner with IDIO Gallery, Brooklyn based contemporary art gallery and performance space that has been focused on experimental work across media with critical engagement.